My wife and I were looking through old National Geographic magazines in the Davis branch of the Yolo county library when we found a Land-Rover Dormobile! 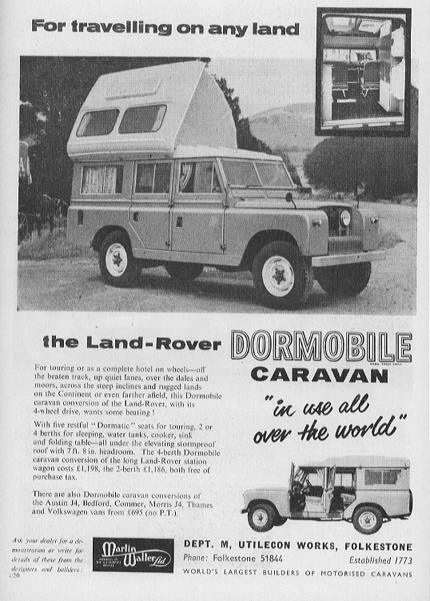 Except for advertisements, I had never seen a Land Rover Dormobile in a magazine before and would like to ask you to send me any information you have. I am interested in articles like the one below where the vehicle was used for transportation as well as any other article or reviews. The particular National Geographic is April, 1965. On page 548 begins an article by Nathaniel T Kenney and James P Blair entitiled "Ethiopean Adventure" Nathaniel is listed as the author and James is listed as the photographer. 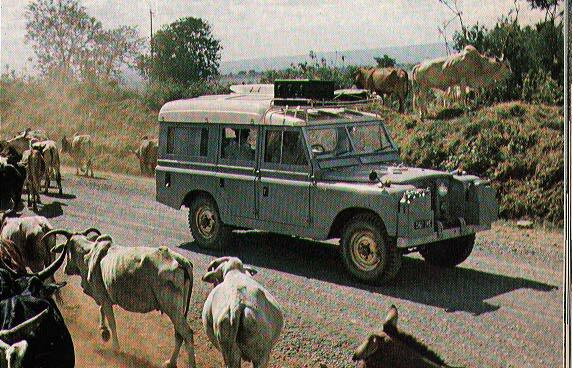 On page 553 is a photograph of a Land Rover Dormobile, driving on a dirt road next to a herd of cattle. On page 566 is another picture, but it shows the Dormobile very small on the landscape. I tried to be polite and ask The National Geographic Society for permission to reproduce the photo on page 553. They said I couldn't unless I paid them; their smallest fee was, I think, $200. I told them thank you very much but I couldn't/wouldn't pay to reproduce the photo. I told them I would give them all the credit and mention that authors and photographer. They said it wasn't fair to the photographer and the society. Oh well. You aren't going to tell on me are you? Later on, I wrote them a letter and asked if they had any other photos of Dormobiles in their vast archives. They wrote back and informed me that they might, but to initiate a search would cost $. I asked "How much?". They charge $75 to do a search and then, if they find anything, they send you quickey color proofs to look at. If you want any of the images, they will supply nice photos but again, they cost money. So, I spent the $75, and found out that they have a few more Dormobile photos from the Ethiopean Adventure article. I don't know if they have anymore Dormobile photos from any other African adventure so I keep my eyes open for old National Geographics and check them myself. On this page are two ads. The one on the left I found by going through old magazines in the UC Davis library. Remember the Dewey decimal system for cataloging books in the library? Well, the library of congress came up with a new system because big libraries couldn't quite fit all the books into the old system. One day, when I was looking for a Barbara Toy book, I spotted another book called something like "A Jeep in Africa". Curious, I pulled it off the shelf and looked at the pictures. In a style similar to a Barbara Toy book, this book was written about a couple guys who drove an old WW II army jeep around the Sahara. Finding that book got me started looking in the shelves for other books that might have Land Rovers in them. I seemed to be in the Africa/travel/adventure section and found bound copies of the East African Journal and the ad for Habib's cars by accident. I really should write Habib a letter and see if he is still in business. The ad below I was made aware of throught the LRO list. In fact, Nick Baggarly got a copy of the magazine before me and sent me a jpeg of the ad. Because I thought it was interesting, I sent off a couple emails to England and soon had a copy of the magazine for myself. Interesting to me about the exterior view of the Dormie in the ad is the lack of a name plate on the wing, the lack of steps on the side and the bizarre orientation of the cover plate in front of the breakfast (grill). I don't know if the photographer was hiding a capstan winch or paint scratches or what, but that plate should be nearly horizontal, mounted on top of the frame rails that extend forward and carry the front bumper. 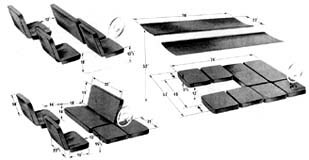 The small interior shot seems to show a different material for the small fold out seat below the wardrobe. Looks to me like old fashion woven speaker grill cloth but I could be terribly wrong.